It's unlikely that any dog wants to be mistaken for a cat, but in the case of one Virginia canine, his look is intentional and it's sparked 911 calls and headlines. A labradoodle (labrador poodle) in Virginia with a clever bit of grooming confused some witnesses enough to call 911, believing what they were seeing was a baby lion roaming the streets. 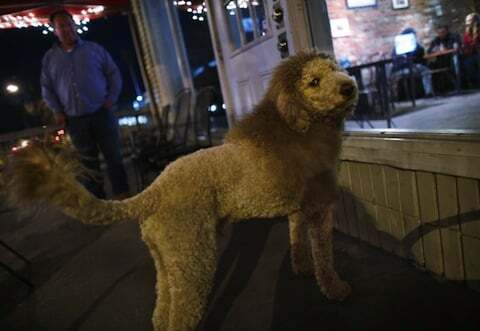 His name is Charles the Monarch, and according to HamptonRoads, he's the dog of Daniel Painter, a Garden Shop owner who had his dog intentionally groomed to look like a lion - and more specifically, the Old Dominion University mascot. That's some team spirit. Given the dog's coloring (assuming his fur isn't dyed), from afar, even in spite of his size, I could see how people might confuse him for a lion. Here's some video of the dog hopping around. Watching the video, which shows what appears to be a very friendly, energetic dog, it's sort of amusing to think that this beast inspired people to call for help. With that said, while neighborhood people might be familiar with the uniquely groomed pup (and he has a growing Facebook following), he's understandably cause for alarm for outsiders who happen to notice him wandering around unleashed. Hampton Roads has three 911 calls on their site that you can listen to, in which people tell the operator that they've seen what looks like a baby or small lion wandering the street.